Eight weeks have passed and you’re finally an Ease Into 5K Graduate. But there are still two aspects of your running you want to improve: you actually want to run a 5K in 30 minutes, and without stopping. If your progress seemed to plateau in the last couple of weeks and your personal best is far from the 30 minutes, you’re not alone. In fact, this is a major concern for those who end a 5K training program. And for those in doubt: Yes. It’s possible to run a 5K in 30 minutes without stopping! But it requires work, some adjustments in your training program and even a few tweaks to your diet! If you have your eyes set on a longer distance, like a 10K, pick up where the 5K app leaves off and get to running a 10K with Bridge to 10K. One fun way to improve your PR is by adding some interval training. If you prefer to train in a running track, you can run a lap at your 5K pace, and then, a slower, easier recovery lap. If you are running on the road, you can use lamp posts to mark intervals. After warm-up, try sprinting from one lamp to the next, followed by a lamp-to-lamp slower run. Repeat the pattern until you’ve covered a mile. To run faster you need to build up speed and endurance. Hill running is an excellent exercise because it builds up your leg muscle strength, helps your aerobic capacity, your stride length, and of course, your running technique. And how about adding some speed training to hill running? You can run up a hill at a high speed and on your way down do some easy jogging or just walk. Endurance is an important aspect of a faster 5K. You need to run at a “conversational pace”, meaning you can talk, finishing your sentences while you’re running. If you find yourself out of breath, just slow down, without stopping. As you increase your endurance, you’ll be able to pick up your pace; but to start, just focus on increasing your distance. Your posture is very important while running. Keep in mind: shoulders back. If you tend to lean forward, it’s harder to breathe. With an upright posture, you’ll breathe more efficiently. Don’t forget your arms must be at a 90-degree angle as you use them to move propel yourself forward. One of the reasons why runners tend to stop and walk while training can be from side stitches. To prevent this, you need to avoid shallow breathing. 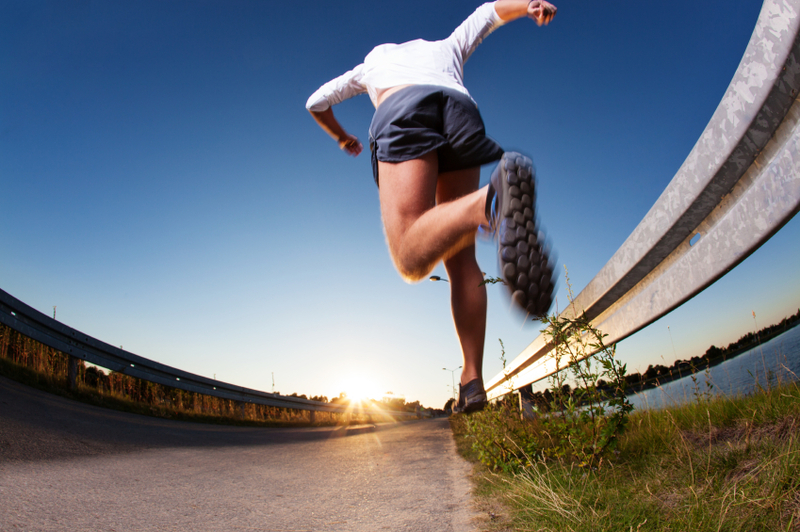 Breathe in through your nose and breathe out through your mouth when you’re running. Don’t forget: breathe deeply from your belly, not your chest which allows you to take in more air. A good balanced diet is important if you have a training routine. Make sure you incorporate carbohydrates, protein and both saturated and unsaturated fat into your diet. You can also keep a food diary and do some research on healthy recipes that will provide fuel for training and recovery. Speaking of recovery, rest is very important to prevent any injury. Make sure you take at least one day off each week. Your muscles will appreciate the day off because they build and repair themselves during rest days. Are you already running a 5K in 30 minutes? Share with the community how you accomplished this goal! This entry was posted in Running and tagged 10K, 5K, Bridge to 10K, Ease into 5K, personal record, run faster. Bookmark the permalink.